Hello! I'm just popping with a quick post today. Happy Thanksgiving to all who celebrate! My turkey is brining, the stuffing and apple crisp made, and now I'm roasting turkey wings for my gravy. Sabrina was up with the sun, and we're watching Charlie Brown Thanksgiving now. :) I appreciate all of you who stop by to visit me in cyber space, and I hope you have a wonderful day! 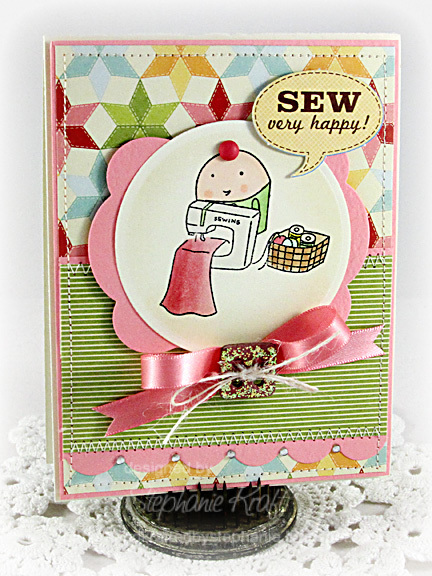 I thought I'd show you a simple card that I made with this month's Taylored Expressions November Key Ingredients kit. Earlier this month, the team posted some projects that are sure to inspire you. You can check it all out on the KI blog, HERE. I've use Crafty Cuppie on my card today. All patterned paper, die cut and ribbon are from the November Key Ingredients. Accessories: Medium Scallop Border Die, Take Note Die 3 (Taylored Expressions), Standard Circle Nestabilities (Spellbinders), Ribbon, Chipboard Button, Sew very happy die cut (November Key Ingredients), Stickles, Twine, Foam tape, Thread, Sewing machine. Sew very cute! I hope you have a Happy Thanksgiving. Such a cute card!! Love those papers! This is just darling! I hope you had a great Thanksgiving!